HomeNewspapers.Com Is Newest Tool In My Toolkit! Newspapers.Com Is Newest Tool In My Toolkit! I’ve been pretty quiet on the blog lately, but that’s because my genealogy research has been moving along at full steam and I can’t find the time to write! I recently obtained a subscription to Newspapers.com and have spent countless hours searching their vast archive of newspapers. Included in that archive are over 100 years of New Castle, Pennsylvania papers and several decades of East Liverpool, Ohio papers. As my paternal family spent many years in or around those two cities, I’m finding great articles covering births, deaths, baptisms, birthday parties and weddings. The Groucutts, in particular, were a very well written about family. For the last two years, I maintained a subscription to GenealogyBank.com. GenealogyBank is also a newspaper archive site but had very little material for the regions of the country where my ancestors lived. In fact, in going through my saved records, I can find only two GenealogyBank articles of any use. Meanwhile, I searched for the surname ‘Groucutt’ and located almost 525 records in Pennsylvania newspapers alone. Most of those are from New Castle and almost exclusively the mentions belong to my ancestors. 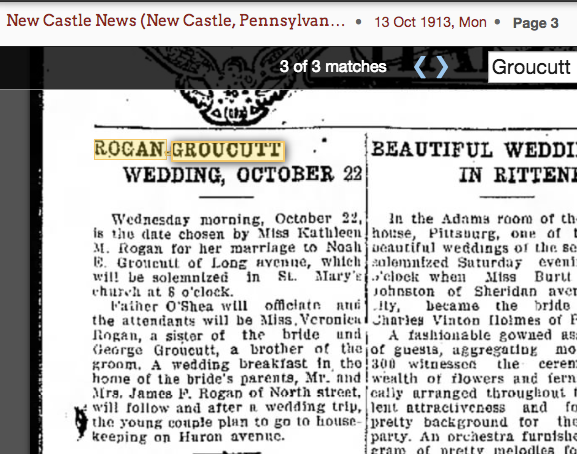 “Rogan Groucutt Wedding, October 22”, New Castle [PA] News, 13 Oct 1913, page 3; online index and digital image, Newspapers.com (http://www.newspapers.com : accessed 24 Nov 2014), Newspaper Archives, 1700s-2000s. “Ms. 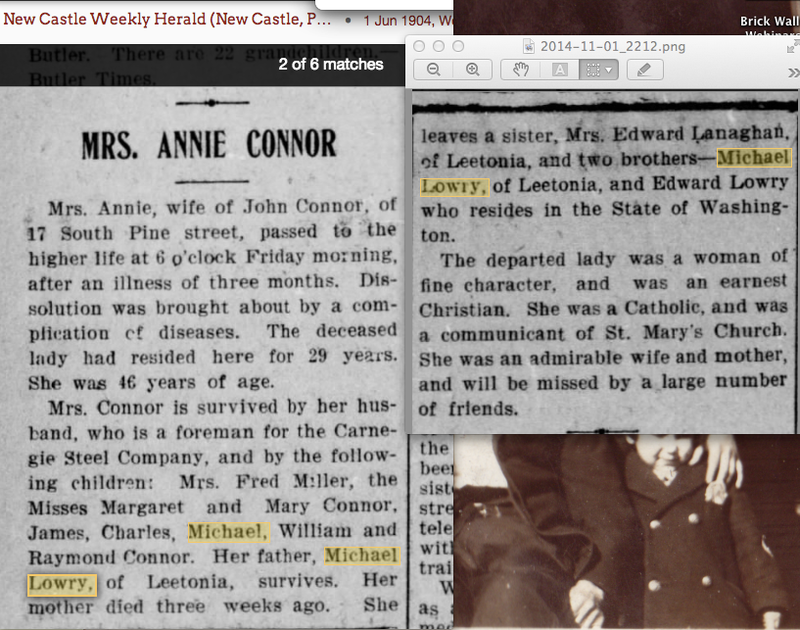 Annie Connor”, New Castle [PA] Weekly Herald, 1 Jun 1904, page 2; online index and digital image, Newspapers.com (http://www.newspapers.com : accessed 24 Nov 2014), Newspaper Archives, 1700s-2000s. “Social News”, New Castle [PA] News, 6 Apr 1914, page 3; online index and digital image, Newspapers.com (http://www.newspapers.com : accessed 24 Nov 2014), Newspaper Archives, 1700s-2000s.